Waiting on Wednesday is a weekly meme hosted by Jill at Breaking The Spine. It features each bloggers most anticipated books. 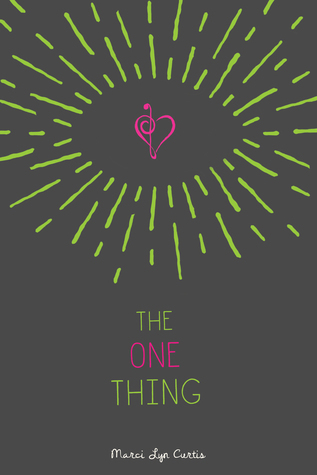 My pick this week is THE ONE THING by Marci Lyn Curtis. "Maggie Sanders might be blind, but she won't invite anyone to her pity party. Ever since losing her sight six months ago, Maggie's rebellious streak has taken on a life of its own, culminating with an elaborate school prank. Maggie called it genius. The judge called it illegal. But when she learns the real reason she can see Ben, Maggie must find the courage to face a once-unimaginable future...before she loses everything she has grown to love." Why I Can't Wait: You guys, I love it when the cover of a book is simple but fits the summary oh so perfectly. I love the fact that this book seems to be about losing something we all take for granted and possibly has a bit of redemption in it as well. Also, Ben sounds adorable, and I'm curious to see (to pun intended) why he's the only one Maggie can see. Plus, hello. His older brother Mason? Hottie who is also the lead singer of a band? Sing Sign me up! Thank you for sharing with us your article, I must admit that I found very useful. Keep sharing such ideas in the future. Thanks for giving me useful information.